We were missing a few people at the meeting last night. I blame it on the heat, it's excessive right now. We usually start our meeting with Show and Tell. Jane showed off her fabulous Diamond Quilt. It entailed a lot of fussy cutting and 4 or 5 layout changes, but it was worth it. Jane also showed this great 16-patch quilt, It's so subtle and soothing. Elvie made this Extra, Extra Long quilt for her tall brother-in-law who loves West Virginia football. She saved fabric for a long time until she had just the right mix. With the scraps from the quilt, Elvie also made a quilt for his dog! We have two Sues! One is a very new quilter, and she made the quilt, above. She even did the fabulous machine quilting, on her small domestic machine! The other Sue, the owner of Needle in a Fabric Stash - our meeting place, showed off the child's' playmat she made. She used many of different techniques, including round corners and bias tape around the center piece. She said this quilt will be on the store's blog on Monday. I showed the "Disappearing Hanging Sleeve" I created for this small quilt. I made this Patchwork Heart Quilt in December 2014. 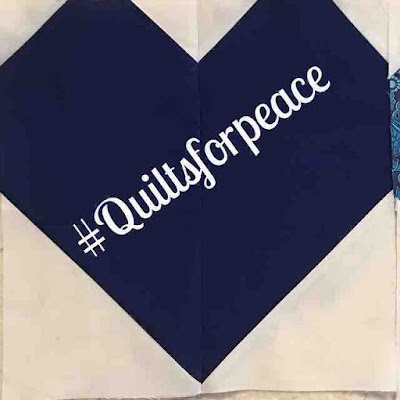 When I made it I had no recipient in mind but now I'm sending it to the Orlando MQG for their Quilts for Pulse quilt drive. Below is the quilt back. Linda brought in this fabulous paper-pieced quilt. The green line around the quilt center is a flange! 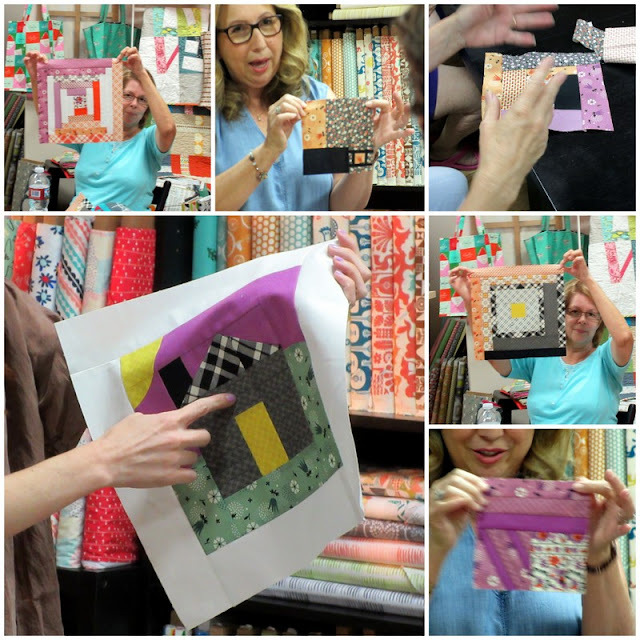 This collage shows the blocks that were turned in this month for our charity quilt. The finished quilt will go to GenerateHope in San Diego. We finished the meeting with at talk by Sue Stone about modern fabrics and what she's learned as a fabric shop owner. There were six beautiful Amish quilts in the Quilts and Color exhibit at the San Diego Museum of Art. All the quilts are on loan from the Museum of Fine Arts, Boston. Floating Bars Quilt, Lancaster County, PA, 1940. Pieced wool, plain weave. Framed Diamond In A Square, Lancaster County, PA, 1920. Pieced wool, plain weave. Framed Diamond In A Square, Lancaster County, PA, 1890. Pieced wool, twill. Thousand Pyramids Quilt, Holmes County, OH. Pieced wool, plain weave. Framed Bars Quilt, Lancaster County, PA, 1920. Pieced wool, plain weave. Snail's Trails Quilt, Arthur, IL, 1930. Pieced wool, plain weave. I think we should do a challenge. Make a quilt using just solids and have it finished by December. Who's up for a challenge? The San Diego Museum of Art is having an exhibit called Quilts and Color, sponsored by the Museum of Fine Arts, Boston. I figure we all have something to learn. I encourage you to go to the exhibit. I had intended to post about our June meeting, but fortune didn't smile on me. I got home from the meeting a 10:30pm and I had a 5:30am pick up, the next morning, in order to get to the airport in time for my flight. I didn't take the time to download the photos, and my camera was lost on the airplane and no one turned it in, so the photos were lost, too.